This weekend, I watched and listened to the October 2014 General Conference of The Church of Jesus Christ of Latter-day Saints, and engaged in discussion of related ideas online. Below are 97 thoughts and highlights, from me and others, about the conference. The thoughts range from affirmations to disagreements, and from questions to assertions. 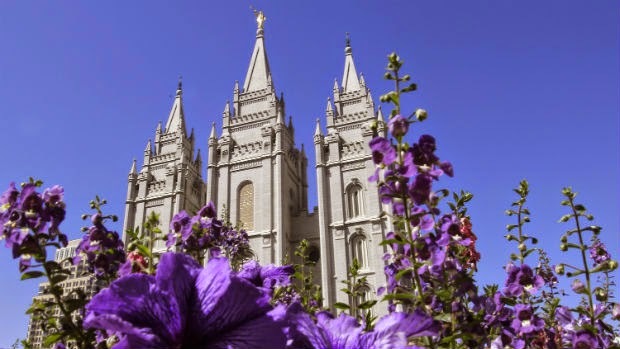 Hopefully they'll provoke reflection, questions, and comments, and contribute to a more meaningful engagement with the ideas generally, and particularly with the Mormon religion and the LDS Church, which are important parts of life for me, many of my family and friends, and millions of others. I love the Mormon Tabernacle Choir, singing thought-provoking lyrics of "High on the Mountain Top." President Thomas Monson, escorted with an aid at his arm, delivers brief introductory remarks. I wonder about his health. He looks well. President Boyd Packer, not looking well, appropriately opens conference with thoughts on Jesus Christ. Elder Lynn Robbins suggests that general authorities do not work both directions, but Jesus seems to disagree. Lynn Robbins says lowering Church to world's standard is apostasy, but what about rising, as with blacks and priesthood? I share Lynn Robbins' interest to resist intimidation, but what of humility? We're not perfect, as individuals or as a Church. Sister Cheryl Esplin discusses the sacrament, Mormon communion, which is among my favorite rituals, promising to think and act, to be, as Christ. Elder Chi Hong Wong presents in Cantonese, the first non-English language used in modern LDS Church General Conference. Unfortunately, the video broadcast includes an English voice over the Cantonese. It would have been better with subtitles. Chi Hong Wong tells one of my favorite stories about Jesus, teaching we have power to forgive each other. Elder Todd Christofferson explains God wills goodness, but allows moral agency. Why? What's more valuable to God than goodness? There's power here. Todd Christofferson says a God that makes no demands is the functional equivalent of a God that does not exist. Dieter Uchtdorf begins his speech with fabulous astronomy images. Dieter Uchtdorf discusses how our cosmological knowledge changed in ways we hadn't imagined thanks to astronomy. Dieter Uchtdorf imagines how persons from the past would react if we were to describe our modern technology to them. Dieter Uchtdorf says some persons from the past would condemn or harm us for sharing our knowledge of modern technology. Dieter Uchtdorf, by analogy to ancient perspectives on modern technology, encourages us to imagine God. Dieter Uchtdorf encourages courageous pondering. Ask hard questions. Dieter Uchtdorf draws parallels between the scientific method of gaining knowledge and the way we should seek spiritual truth. Dieter Uchtdorf says the LDS Church is a place for persons who are both certain and unsure. I love Dieter Uchtdorf's embrace of diverse persons at Church, but I wish also to hear encouragement of constructive disagreement. Concluding prayer of the opening session of LDS Church General Conference starts with thanks for the technology that enables us. Just listened to Elder Jeffrey Holland’s speech on the Christian imperative to care for the poor. Woah. LDS Church Men's Conference starts with "Rise Up, O Men of God"; may we, Mormon men or not, rise together in compassionate Godhood. The missionary choir sings "Called to Serve", reminding me that another Transhumanist received his LDS mission call today. Elder Quentin Cook says overall happiness and well-being are decreasing, but I think data shows the inverse. Quentin Cook joins celestial glory with valiant testimony of Jesus; what is that if not being Christ, in action, with Jesus? Bishop Dean Davies recognizes both technological improvements to life for many and still much opportunity to alleviate suffering. Dean Davies appeals to the powerful words of Isaiah in support of his call to care for the poor. President Dieter Uchtdorf says that outwardly functional and spiritually dysfunctional congregations are not rare in the Church. Dieter Uchtdorf encourages me to ask myself, in response to criticism, "Is it I?" I love Mormon tweets thanking God for Twitter, appropriately, even if not intentionally, collapsing divine and human categories. President Henry Eyring tells about his father, a prominent scientist, who trusted him to provide feedback in spiritual matters. If you've not learned about Henry Eyring's father, a prominent scientist, you should. President Thomas Monson says the greatest power on Earth is God working through humanity, collapsing divine and human categories. Opening prayer of the Sunday morning session pleads that we, divine humanity, may be answers to the prayers of the poor, echoing yesterday's admonitions. Mormon Tabernacle Choir starts off with "Praise to the man ... mingling with Gods". This isn't just Joseph Smith, but all of us. President Henry Eyring says logic isn't enough for humanity traversing turmoil. He's right. In its most vital moments, life cannot wait. On the other hand, while it is never enough in itself, logic should ever more deeply inform our esthetics. Henry Eyring lauds Mormons' ability to respond to disasters. Concerned with catastrophic risk? Take note. Elder Russell Nelson overstates when claiming LDS Church presidents' words are "utterly true." Some have expressly disagreed with that. Russell Nelson, why is emeritus status appropriate for some general authorities and not others? Russell Nelson says no one man can ever lead the Church astray, but are we always right as a group? What of blacks and priesthood? As Russell Nelson speaks, it strikes me as deeply important to recognize our ability to support each other even when we disagree. Sister Carol McConkie continues the theme of bolstering support for ecclesiastical authority in the Church President. What's coming? Carol McConkie says "following the prophet is always right," but Joseph Smith warned no person always speaks as a prophet. I heartily share Carol McConkie's estimation of Joseph Smith as prophet, but I don't agree with everything he ever said or did. Elder Robert Hales cites some of the most sublime words of Jesus, praying for divine unity among all of us. When prophetic words are spoken, I feel them bodily. They resonate in my mind, provoking conformance to the image of God. I share Elder James Hamula's celebration of sacramental sanctification, reminding us to think, speak, and act as Christ. After others' appeals to obedience, President Thomas Monson immediately appeals to individual agency and Jesus' example. Thomas Monson describes obedience in context of Jesus' example. It is a virtue only if it is conformance to the image of God. Thomas Monson advocates trust in and conformance to Christ, exemplified by the consolation and healing of Jesus. This was a tough session for me. I'm concerned with abuse of obedience admonitions, but I think Thomas Monson channeled them well. Elder Russell Ballard says unity of the First Presidency and Twelve Apostles is required to constitute the word of God for the Church. If unity of the First Presidency and Twelve Apostles constitutes the word of God for the Church, how broadly do we get that? Elder Richard Scott cites a profound idea in the Book of Mormon: meaning arises from categorical dichotomy. Elder Carlos Godoy says, above scriptures and prophets, we have personal revelation to guide us. This is a challenging tension. Carlos Godoy encourages us to expand our knowledge, both intellectual and spiritual, to our full divine potential. Elder Allan Packer refers to Joseph's claim that salvation is communal. Without each other, we can't be perfect. Allan Packer observes that technology, in combination with doctrine, is essential to the work of the Church. Hugo Martinez observes that our prayers can be answered through our personal ministries to each other. Hugo Martinez says we become saviors as we strengthen our relations with each other and our ancestors. Hugo Martinez delivered a fabulous talk on internalizing Christ as we seek to be disciples of Jesus. The Mormon Tabernacle Choir sings the beautiful and inspiringly understated idea: "I Am a Child of God." Elder Larry Kacher reaffirms that faith should be understood to be compatible with sincere questions and humble pursuit of truth. An implicit, not always true, assumption in some LDS discourse on doubt is approval only when it results in LDS affiliation. Elder David Bednar says "absolute truth exists." Joseph said God inspires according to circumstance. How do these ideas relate? President Thomas Monson concludes the conference with reminders to Christian discipleship, and to care for the poor -- all of us.